Is Your American History Textbook Lying to You? 1. Who segregated the federal government? A. No one -- it had always been segregated. 2. True or False? The first black player in the major leagues was Jackie Robinson. 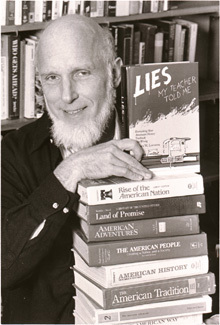 James W. Loewen, author of Lies My Teacher Told Me: Everything Your American History Textbook Got Wrong. Photo credit: Sally McCay. the Avery Research Center, and the School of Education. 1. D. Woodrow Wilson in 1913. Lincoln desegregated the White House staff in 1863, which, in turn, began a desegregation of the federal government that lasted until Wilson. 2. B. False. Robinson was the first in the 20th century. Blacks played major league baseball in the nineteenth century until a protest by the president of the Chicago White Sox led to the Baltimore Orioles expelling the last, their third baseman, in about 1889. Questions and answers adapted from Loewen's quiz Did High School History Prepare You to Take This Test? Lies My Teacher Told Me: James Loewen's website, where you can take his quiz Did High School History Prepare You to Take This Test? or send him email. Amazon.com talks to James W. Loewen: an interview with Loewen from 1999. James Loewen: interviewed by Brian Lamb on C-SPAN's Booknotes, in March 1995. This page was last updated on 6 October 1999.